Yes, we’d all love to have those perfect, magical mornings. Waking up without the need for an alarm and drinking your 8oz of water with lemon. Then rolling out your mat to start the day with a yoga + meditation practice. Sounds heavenly. Also sounds unlikely, am I right? Tell me if this sounds more likely… Being jolted awake by the sound of an alarm. Hastily scarfing down breakfast while running around like a chicken with your head cut off. Then rushing out the door, already 10 minutes late to start your day. No zen. No peace. No calm. I can’t promise that this practice will create a perfect, magical morning for you. But if you’re willing to wake up just 18 minutes earlier, I can promise you a little bit of zen with which to start your day. I have created an entire 7-day experience called Morning Magic because I believe that the way you start your morning has the power to shape your entire day. If you’re starting your day stressed and scattered, then there’s a good chance that the rest of your day will feel stressed and scattered. Starting the day with yoga increases mental clarity and mindfulness, and kickstarts the physical body. It sets a positive, accomplished tone for your whole day, which sets you up for success. First thing in the morning is also one of the best times to practice yoga (ideally, as the sun rises). The distractions of the day haven’t had time to grab you yet, and although the body might be a bit stiff, the mind is usually crystal clear. If you can squeeze in an extra minute or two after your practice to journal, this is a great time to do that as well. If you want to experience the Morning Magic, I highly recommend joining the 7-day challenge! You can learn more here, or sign up below. 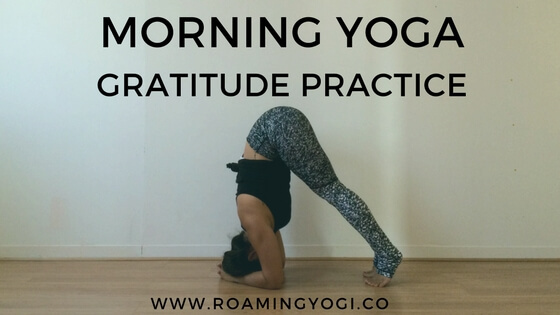 This morning yoga gratitude practice is bound to start your day off right. Starting (and/or ending) your day with gratitude is a beautiful, powerful practice. One that keeps you grounded in the here and now; with an appreciation for all that you have and all that you are. All you need is 18 minutes for the best start to your day. So instead of hitting snooze, roll out that mat. I’ll meet you there. This is my first time doing this with you,I have a gratitude practice with Justin Williams,his practice is 5minutes long and it can be done in bed;I enjoy this one because there’s a bit more movement; either way I’m good, thanks for your time; this is an awesome video. 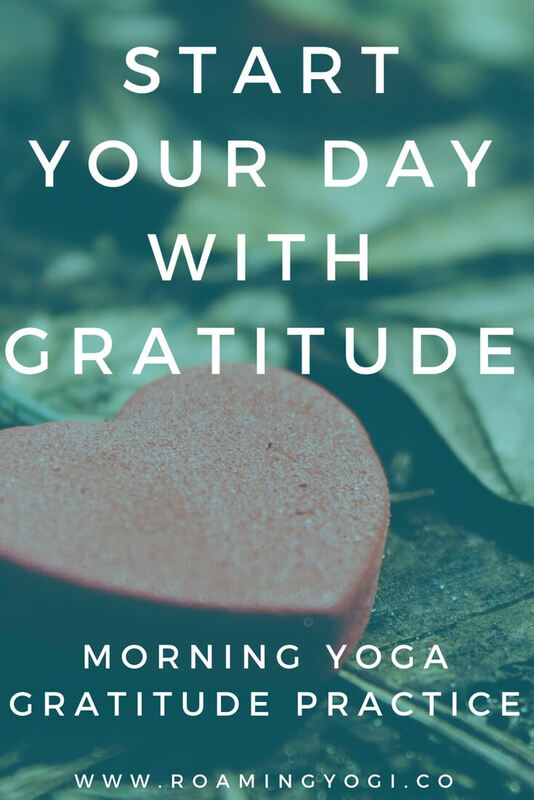 Lovely practice to wake up the body and a sense of gratitude. Thank you for sharing this practice sequence! I’m so happy you enjoyed this one, Cara! I have an entire morning yoga challenge in the works; it’s going to be 7 days of 15-20 minute practices (similar to this one) to help you start your day 🙂 If you’d like to join the online tribe and be notified when it goes live, you can sign up here: http://bit.ly/theroamingyogikula . Have an awesome day!